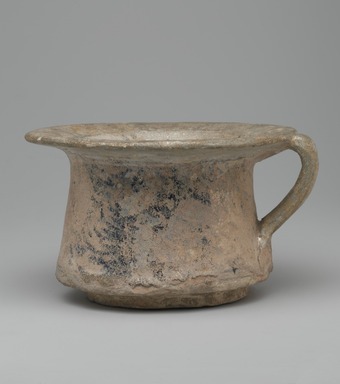 Large cup with a low foot, straight sides sharply canted above the foot and slightly tapering toward the mouth, with a wide, almost flat mouth rim and one curved handle that springs from the lower part of the body to the outer edge of the mouth rim. Soft grayish, sandy (siliceous) pottery covered with a transparent colorless lead glaze, now iridescent, which ends in an uneven line on the lower part of the body, and decorated on the outside with a wide band of intricate vine scrolls in cobalt blue under the glaze. The design is partially hidden by the iridescence. The mouth rim has been broken and repaired, and there are kiln blemishes on the bottom inside of the bowl.